May 25. After an early breakfast outside at the lodge, we are driven some two hours to Lahad Datu, where we have coffee at the main office of the local travel company and transfer to another vehicle in order to continue to the Borneo Rainforest Lodge on the shores of the Danum River. The additional 2 1/2 hour drive, much of it on windy gravel roads, takes us through logged and regenerating forest areas, providing a perspective on the challenges of conservation in this region, though, according to Juan, logging is now under control (and Ronald, a guide at the Rainforest Lodge who rode with us confirmed this). Palm oil, sold to Asia and the Middle East is the number one source of revenue in Sabah. 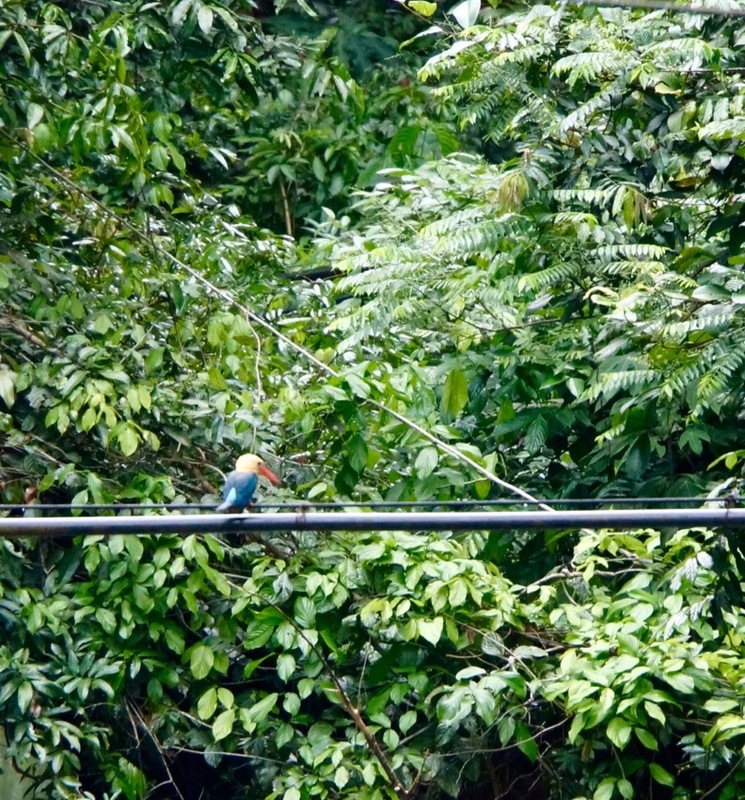 En route to the Lodge, we stopped to see this stork-billed kingfisher. 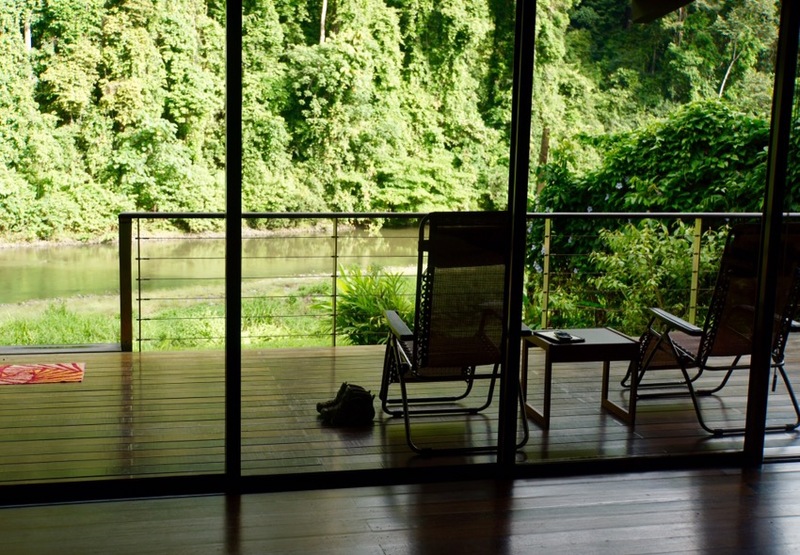 The Borneo Rainforest Lodge is located in Sabah’s largest protected lowland forest—the Danum Valley Conservation Area—that is made up of 108,230 acres of pristine virgin rainforest. The dipterocarp (broad-leaved evergreens) forest found in Borneo is considered to be the world’s tallest and oldest, having existed for over 100 million years. It is also one of the world’s richest areas for species variation with a rolling green canopy more than 200 feet (60 meters) above the ground. 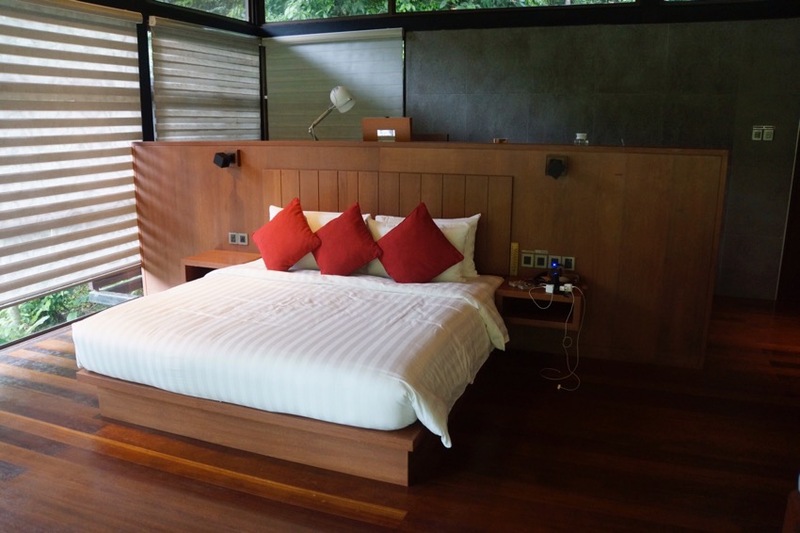 Built in the style of local Kadazan/Dusan dwellings, the lodge provides tasteful, simple (we and the Lewises have the premier rooms, which can hardly be described as “simple”) comfort in a tranquil atmosphere, featuring stilted chalets and bungalows built and finished with local hardwoods at the height of the treetop canopy, affording a true immersion in nature and an up-close wildlife experience. 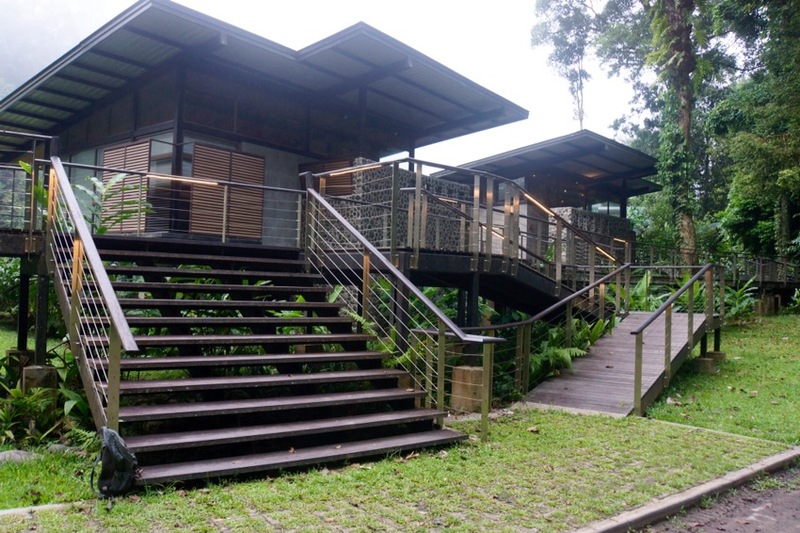 This is a place to observe wildlife, and everything about the lodge supports this purpose: large open public spaces and verandahs, well marked nature trails, a canopy walk for tree level viewing, a well stocked library and a team of naturalists and guides ready to serve at all times. We have one of the three new units–beautiful. Comes with leech socks, pancho, bottle of prosecco and use of Swarovski binoculars, and complimentary laundry service, not to mention private dipping pool, outdoor shower and your own butler. Right on river with beautiful views. The lodge is quite special, both the accommodations and the setting. 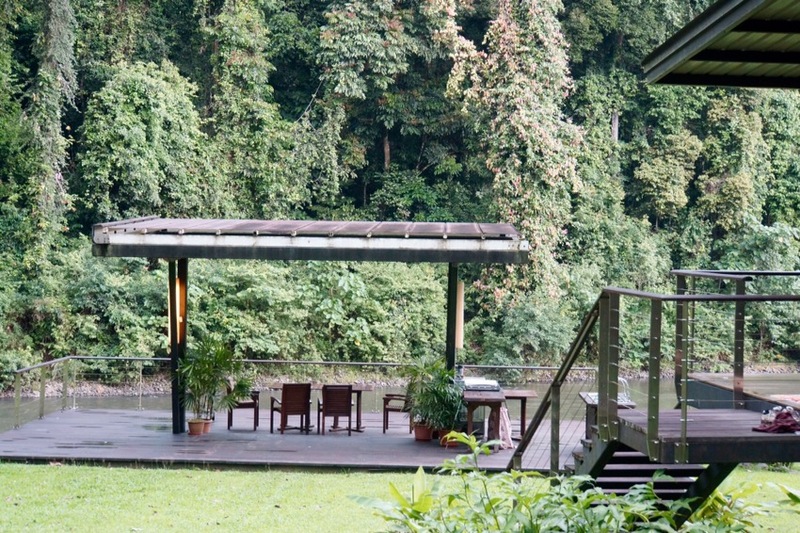 After an excellent buffet lunch at the main lodge, we have a couple hours to rest on the deck of our room overlooking the river before going out for a birding walk with our guide, Azmil. 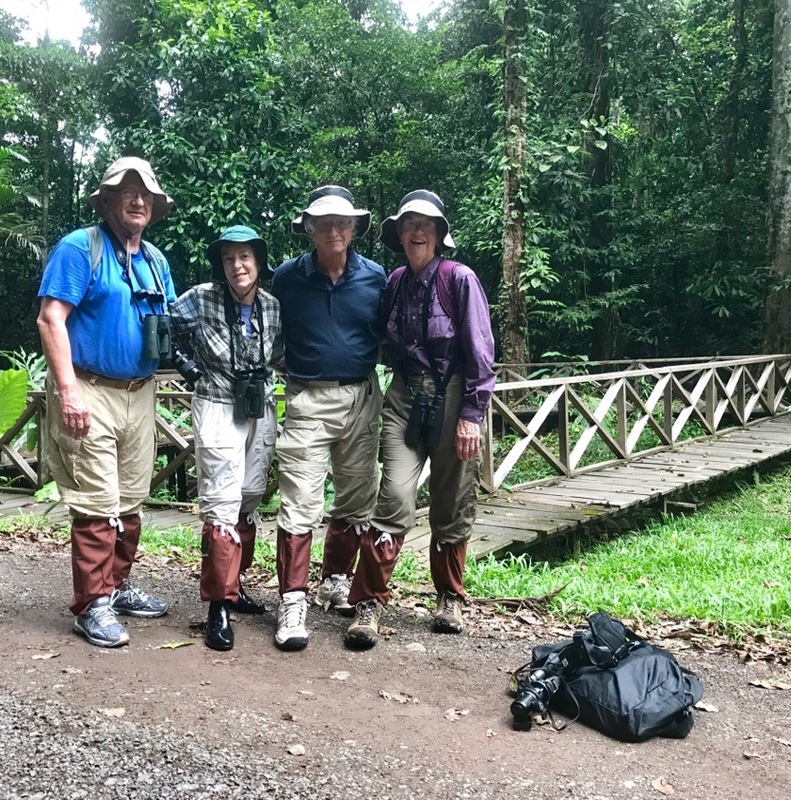 Here we are with the Lewises in birding garb, and complete with leech socks to protect us from leeches. We did not see too much, but Azmil is clearly very expert, finding a Gibbon monkey lying on a branch in the far distance and showing it to us in his scope, then succeeding in calling a pitta bird with a combination of his whistling and playing bird calls through his iPhone. We walked along the dirt road, but the forest loomed on both sides. After a couple hours we returned to our room for an outdoor shower and a change of clothes. An hour later we were picked up for a night drive in an open truck. The drive was totally unremarkable in terms of seeing animals, but being out in the forest under the stars made it worthwhile. And I took 60 or 70 photos from behind the guide with the light, creating what (to me, anyway) are interesting and random abstract patterns. I’ll include some of them in a separate post. After the drive we had an excellent buffet dinner at the main lodge, and then returned to our room to retire. Leeches? That did it for me.